New York, NY Last week researchers at Colombiana Medical Center announced that they had successfully isolated the molecule that they say causes happiness. Scientists are hopeful that this so-called �happy molecule� can be used in different applications from treating postpartum depression to curing seasonal affectation disorder. �This is a breakthrough discovery in how we look at treating mental health,� said team leader Dr. James R. Crabtree, (cousin of John H. Crabtree). Preliminary observations suggest that this molecule is unique because of its high propensity for interaction with other molecules. 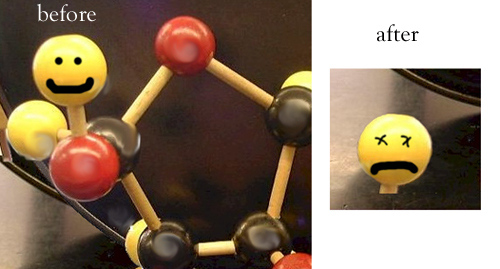 In a related study scientist observed the �happy� molecule in isolation. Under these circumstances scientist noted different behavior patterns. �In isolation, this �happy� molecule showed much lower levels of activity. It engaged in a lot of sitting around and watching MTV. There were requests to be able to use the phone too, but we had to say no because that would kill the whole point of isolation, now wouldn�t it?� Crabtree explained. The study concluded that in isolation this �happy� molecule becomes depressed and on average lives only half as long as compared to a natural social environment.